21 Mar Can You Help Sebastian? When Sebastian was 4, he had his first seizure. At age 6, he started losing his vision. After DNA testing, we finally had a definitive answer: Batten CLN8. Receiving the news that your child has a fatal neurological disorder is devastating. We need $3.5 million to keep our child alive. We are raising money for the research, development and application of gene replacement therapy to treat Batten CLN8. Our hope is that the therapy will be used to treat not just Sebastian, but anyone diagnosed with Batten CLN8. The doctors and scientists have developed a gene replacement therapy to treat Charlotte and Gwyneth Gray, who suffer from Batten CLN6 – a very-similar disorder. The Gray family is using the science developed to treat Charlotte and Gwyneth to help other families with children diagnosed with Batten CLN6. Much of the same science will be used to develop the treatment for Batten CLN8. The doctors and scientists have to develop the replacement CLN8 gene and perform various trials before it can be applied to Sebastian – hopefully in May or June. Publishers’ Note: If every person reading this magazine donated $5 for every person living in their household, Sebastian’s family could raise over $1 million in minutes. The financial need is immediate; Sebastian needs help now… The science is good – and we’re this child’s best chance at life. We’re all donating – and we’re asking you to, too. Please, please grab your phone or head to the computer and donate now at www.curebattencln8.org. Meet Anna, a sweet 7-year-old girl who is mostly non-verbal with impairments to motor function similar to cerebral palsy and autism. 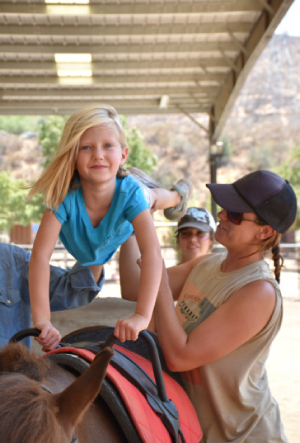 She began riding at Carousel Ranch last year and has made great strides in her speech, signing, body awareness, sensory integration and overall physical strength. The horse calms her and gives her the input that her brain needs, allowing Anna to sit still and hold the saddle’s handles for prolonged amounts of time. “Since starting at Carousel Ranch, Anna has begun to trust her movements more, has a stronger core and seems more willing to do things that made her nervous before,” said Anna’s parents. Simply, Carousel Ranch changes lives. Each year, many children with special needs wait for the opportunity to improve their health and experience life at Carousel Ranch. The ranch is growing to serve more children and you can help them reach this goal by supporting their “Carousel Wishes & Valentine Kisses” annual giving campaign. Again this year, you can double the love thanks to long-time ranch supporters Wayne and Dianne Crawford, who will match every dollar raised up to $25,000. Together, we can make a difference – one very special child at a time. www.carouselranch.org. Mission Valley Bank’s local roots run deep motivated by the desire to be an integral part of the area they serve. A strong community thrives on personal relationships and Mission Valley Bank supports – and is honored to be supported by – the Santa Clarita Valley. Mission Valley Bank is more than just another local bank. They are a full-service, independent, commercial bank that is locally-owned, community minded and relationship driven. They’re proud to have earned their reputation as Trusted Advisors. Mission Valley Bank is as dedicated to their customers’ success as they are. They appreciate their business and welcome the opportunity to earn yours. © Sebastian Velona Foundation 2017, All Rights Reserved.